The one discovering this stitch is most likely a girl Katillia. She makes the most beautiful scarves and sell them on Etsy. She calls herself AugustWillows and you should visit her at Etsy and instagram. I exchanged a few words with her on instagram. It sounds like she discovered the stitch by accident, while trying to learn herself to crochet. And from what I can see from previous instagram posts, she has been asked about the stitch many times and also several times tried to explain, what she did. 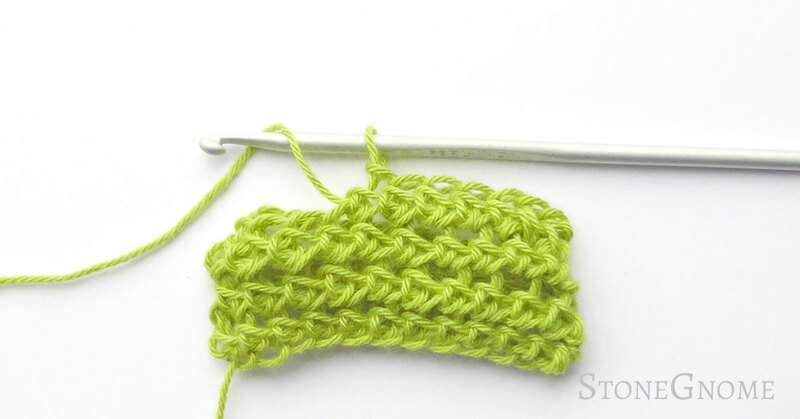 The stitch is a variation over the half double crochet stitch (HDC). begin with yarn UNDER instead of yarn over. hold on to the loop on the hook with your index finger (or thumb). yarn over and pull through one loop. (You can now relax your index finger, if you want). yarn over and pull through 3 loops. I've been asked to make a video for those, that find it hard to understand the written explanation. Now, I hope I do this the same way AugustWillows does. At least the result is similar. Check the video below. The samples I've made are done in rounds. Going back and forward in rows will give you a different look. Keep a very very loose tension to make a nice fluffy stitch with lots of room for the yarn to claim the space. The structure of the stitch pattern is great and works well with cotton and cotton blends, without the result being knotty. Did you notice the pattern almost show the letters AWW? As in, "aww, what a lovely stitch pattern", or as in "AugustWillows".